We hope that you enjoy a wonderful holiday season with your friends and family! The upcoming Fall MRS Meeting in Boston will certainly not disappoint the electrochemical science crowd. It is exciting to see how extensive the use of electrochemistry has become for the materials sciences areas, namely those in energy transfer, storage, and conversion and in materials characterization and production. New Electrochemical Paradigms – What are you Researching? The electrochemical scientists at Pine Research, while perhaps a bit biased, find electrochemsitry to be one of the most progressive and popular areas of materials engineering and analytical science. On occasion, we hear the phrase, “haven’t you discovered all there is to know about electrochemistry back in the 1960’s?” Indeed, some may not be aware of the recent renaissance of electrochemical science in the past decade. As the world demands high capacity and high-efficiency power systems (batteries, solar cells/photovoltaics, fuel cells, artificial photosynthesis, etc.) that are as sustainable and green as possible, the modern scientist who may not have been aware of electroanalytical chemistry are now finding it an essential component of their research program. 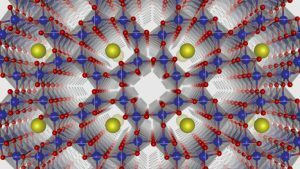 Crystal structure of alpha manganese oxide, studied for the new Unified Electrochemical Band-Diagram Framework (UEB) model (credit: Argonne National Laboratory). A recent article in ScienceDaily is quite intriguing . In it, the author describes that existing understanding of complex electrochemical systems relies on solid mathematical models; yet, these models do not provide a comprehensive understanding commonly observed behavior in electrochemical systems. Namely, in semiconductor applications (e.g., photoelectrochemistry and supercapacitors), the existing electrochemical models fail to explain complex mechanisms of the materials used, which have unique properties not captured by existing models. Researchers at Argonne National Laboratory have published an article describing a new model for understanding the materials used in electrochemical systems: The Unified Electrochemical Band Diagram Framework, published in the Advanced Functional Materials . Visit Pine Research at the 2018 Midwest Regional ACS Meeting at Iowa State University in Ames, IA from 21 – 23 October 2018! 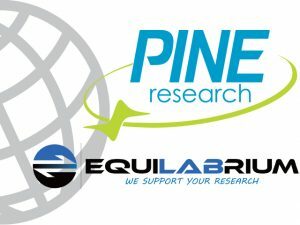 At Pine Research, we are eager to learn about your new discoveries. How has electrochemistry shaped and informed your research? What accomplishments in the field have you made? Come tell us all about it! We will be exhibiting at the upcoming Midwest Regional ACS Meeting at Iowa State University in Ames, Iowa (October 21 – 23, 2018). Share your research with us and learn about our products that might support your electrochemical research. We will have our new WaveDriver 200 Integrated Bipotentiostat (with electrochemical impedance spectroscopy, EIS) and the WaveVortex 10 Electrode Rotator for you to explore. See you soon – and enjoy the article! DOE/Argonne National Laboratory. “Electrochemistry: Greater than the sum of its parts.” ScienceDaily. www.sciencedaily.com/releases/2018/09/180918110958.htm (accessed October 15, 2018). 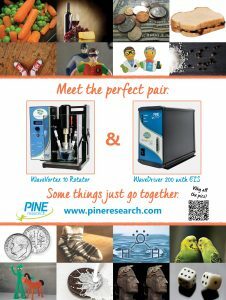 Last May, Pine Research announced the WaveDriver 200 Bipotentiostat with EIS at the 233rd ECS Meeting in Seattle, WA. We were thrilled to finally be able to offer Electrochemical Impedance Spectroscopy (EIS) and related analysis tools for the first time in our company’s proud history. In celebration, we threw a massive beach party filled with tons of swag and giveaways, including beach balls and frisbees! The weather in Seattle doesn’t easily lend itself to a beach party; however, the Fall 2018 ECS Meeting is conveniently in a slightly more tropical locale! This year’s joint ECS and SMEQ meeting (AiMES) is in Cancún, Mexico. This destination conference is a great opportunity to stay current on the latest electrochemical research while enjoying the tropical atmosphere of the Moon Palace Resort in beautiful Cancún. As such, we thought it would be fitting that you can pick up a beach ball or a frisbee at the Pine Research booth #18. If you didn’t have a chance to see the WaveDriver 200 at the Seattle ECS meeting, come experience it at AiMES 2018. Since our initial announcement of the WaveDriver 200 Bipotentiostat with EIS at the Seattle meeting we’ve been working around the clock to make sure the instrument is ready to ship. You can currently find more information about the WaveDriver 200 on our website, and while you are visiting our booth to grab a beach ball, you should also check out our new and improved AfterMath Data Organizer Software with excellent new features like circuit fitting, data import, and much more. If you are planning on attending AiMES 2018, stop by the Pine Research booth #18 in the Universal Ballroom on the 2nd floor of the Expo Center. Check out our new WaveDriver 200 Bipotentiostat with EIS. Or at least stop by to grab some beach swag while you’re in Cancún! From humble beginnings as “the electrode rotator company,” Pine Research has considerably grown over the last decade. In this time, Pine Research has expanded their product line, adding research grade EIS-capable potentiostats (WaveDriver 200), advanced and more cost-effective electrode rotators (WaveVortex 10), integrated spectroelectrochemical analysis systems (based on the Honeycomb spectroelectrochemical cell), and a large array of applications-oriented electrochemical cells. Our European customers have also grown over time and while we enjoy traveling to Europe to attend conferences and visit customer labs, we are not able to be as present as we would like to be. Further, European customers have been increasingly asking for a local representative.